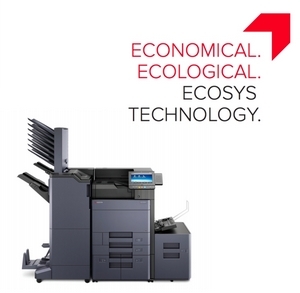 Kyocera has just announced the impending launch of the Ecosys P8060cdn, a printer designed for SMEs. On the program: high capacity, energy savings and reduced environmental impact. As standard, the specs are already high: a basic print resolution of 1,200 x 1,200 dpi, print speeds of 60 ppm in monochrome and 55 ppm in color, (expandable) paper capacity of up to 7,150 sheets ... and several professional finishes are available too. The Ecosys P8060cdn runs HyPAS, Kyocera's Hybrid Platform for Advanced Solutions, and thus supports Kyocera Mobile Print, Apple AirPrint and Google Cloud print as well as the long list of document capture and print accounting systems which are also compatible with HyPAS. The machine also features Wi-Fi direct and NFC for easy access using mobile terminals. - Kyocera's latest toner has very small particles and uses less heat to print - resulting in lower electrical consumption and higher print quality. Colors should be more vivid, and (especially) the thinnest black lines are sharper. We hope to have one of these machines through the lab very soon, and we will let you know what we find. As with other recent Kyocera machines, empty toner cartridges can be used as waste toner bins (they are the same size and shape) which helps to reduce landfill waste. - the new machine supports Kyocera Fleet Service (KFS), a cloud-based maintenance and service software tool that allows technicians to intervene remotely on the machine in the event of a problem.